A Financial Reporting Analyst drafts documentation that projects the financial standing of the organization, the so complied information is submitted both to the internal and external sources for creating budgets, conducting audits and issuing stocks. The financial statements are prepared by the financial reporting analyst by using the General Accepted accounting principles. 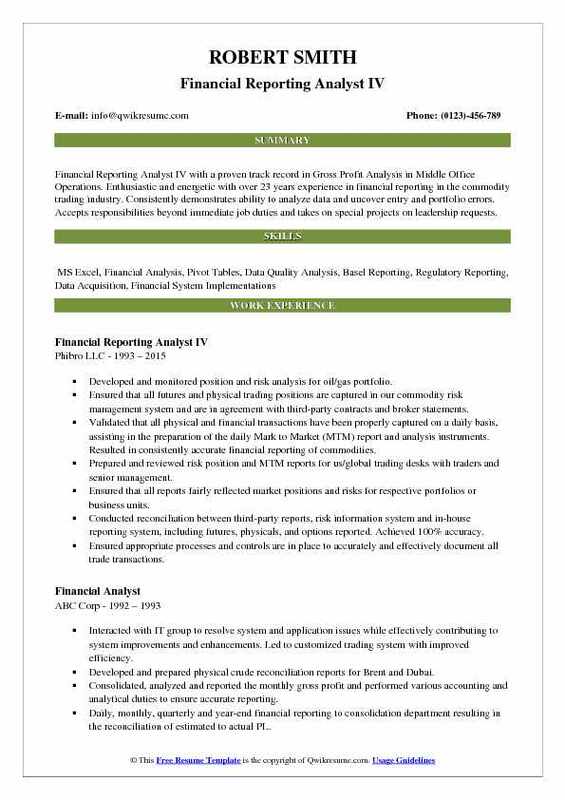 Apart from handling the financial statements the job description of a financial reporting analyst comprise of other tasks like analyzing income/expenditure, reconciliation of financial statements, file regulatory reports, providing related data for audits, issuing data for SEC – security and exchange commission filing and preparing annual reports. 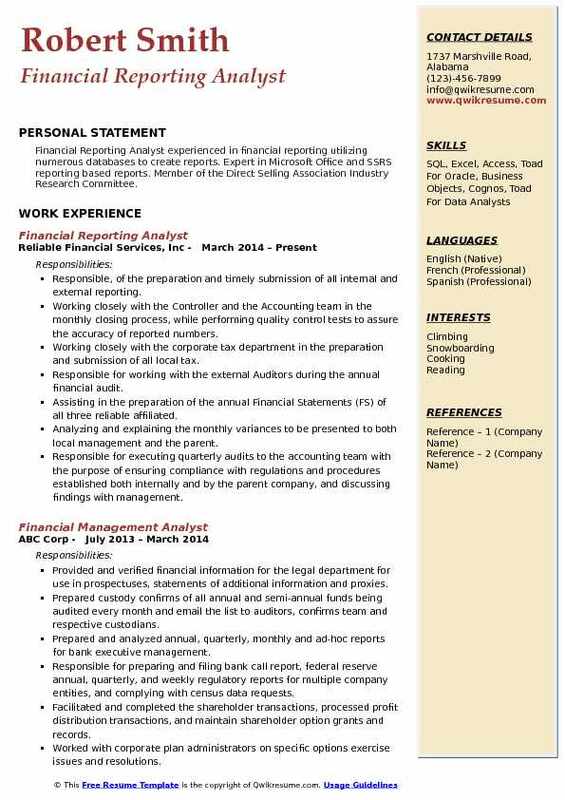 The minimum educational requirement that is needed to make a career in this line is to possess a Bachelors degree in finance, accounting or management; however some employers look out for a Financial Reporting Analyst Resume sample that contains specialization or certification or licensure in the related field like CPA or AICPA. Summary : Financial Reporting Analyst III with 21 years of experience is looking for a challenging career that will utilize my skills and strengths in financial reporting and analysis, governance and compliance, system and data analysis and play a vital role in the company's operational growth and financial success. Responsible for financial statement preparations, audit work papers and footnote support and disclosures. Preparing and analyzing the quarterly consolidated financial statements. Preparing the year-end audit work-papers, financial reports, and footnotes. Prepare and file quarterly external reporting for government bureaus and bank compliance. Allocating income to the proper investments and reconciling consolidated income against FIMS. Maintaining the ownerships in FIMs based on information provided by planning, accounting or legal department. Analyzed reports of information from the accounting system (sap) to create quarterly forecasts and budgets. Prepared inputs for the update of the company's financial projections, budget, forecasts, and financial models. Prepared variance analysis between actuals and budget to assist the CFO in monthly reporting. 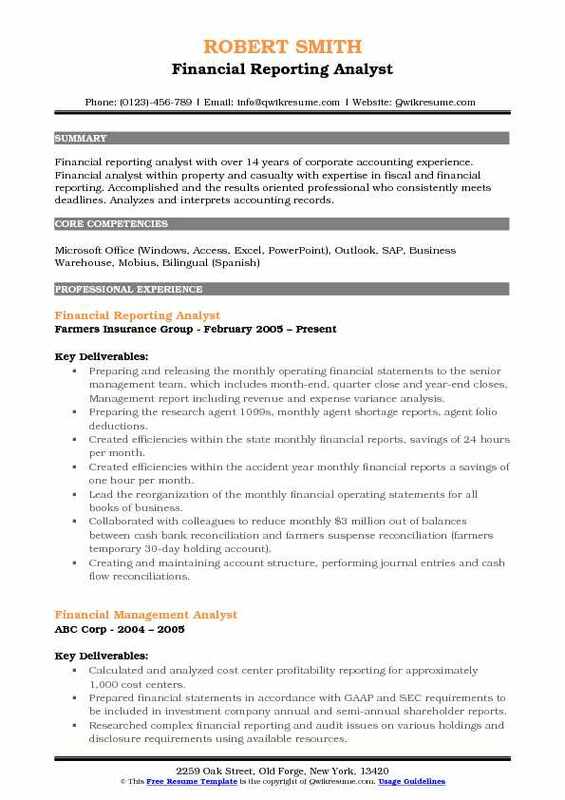 Objective : Junior Financial Reporting Analyst with an extensive background of 4 years in financial reporting including month end closing activities and a working knowledge of treasury support. Thrive on innovation and process improvement projects. Able to effectively build access databases that support accounting compliance and internal policy regulations. Have excellent presentation skills and excel skills including working knowledge of VBA script. Experienced in SAP, Hyperion, Word and PowerPoint. Prepared capital acquisition forecast and budgeting calculations in an effort to support business. Coordinated and presented training to business on how to input and submit numbers for capital. Monitored and approved capital acquisitions which ensured compliance with company policies. Provided management data to business related to a large site expansion project which enabled them to make decisions that coincided with the proposed business case. Performed monthly closing activities such as account reconciliations and journal entries to ensure. Composed financial schedules as well as quarterly disclosures and comments as required by. Prepared property tax renditions for capital assets held in several different states, successfully. Managed the company's vehicle fleet by tracking the registration renewal deadlines and maintaining insurance compliance for both the vehicles and employee drivers. Coordinated the collection of the information for the property and aviation insurance renewal. Responded to legal requests in relation to internal revenue bonds used to perform re-issuance and restructuring decisions. Provided cash management daily forecast and wire output to ensure proper investing structure. 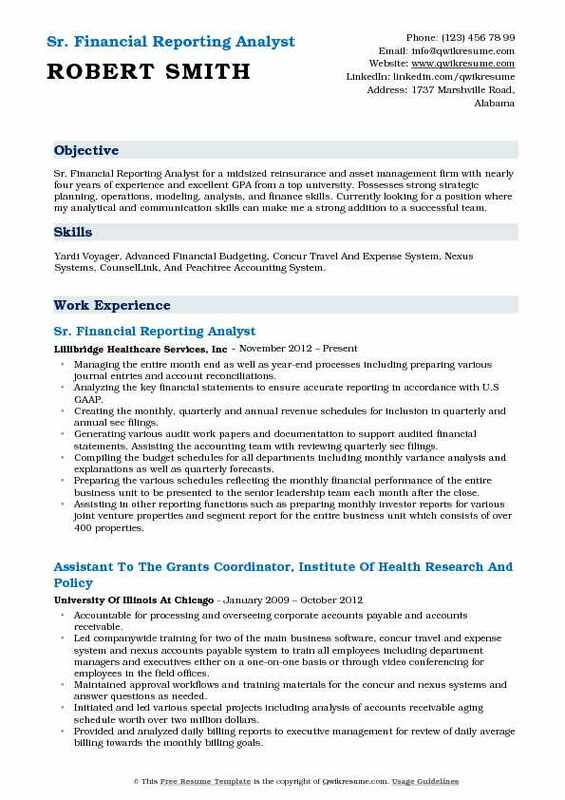 Summary : Financial Reporting Analyst IV with a proven track record in Gross Profit Analysis in Middle Office Operations. Enthusiastic and energetic with over 23 years experience in financial reporting in the commodity trading industry. Consistently demonstrates ability to analyze data and uncover entry and portfolio errors. Accepts responsibilities beyond immediate job duties and takes on special projects on leadership requests. Developed and monitored position and risk analysis for oil/gas portfolio. Ensured that all futures and physical trading positions are captured in our commodity risk management system and are in agreement with third-party contracts and broker statements. Validated that all physical and financial transactions have been properly captured on a daily basis, assisting in the preparation of the daily Mark to Market (MTM) report and analysis instruments. Resulted in consistently accurate financial reporting of commodities. Prepared and reviewed risk position and MTM reports for us/global trading desks with traders and senior management. Ensured that all reports fairly reflected market positions and risks for respective portfolios or business units. Conducted reconciliation between third-party reports, risk information system and in-house reporting system, including futures, physicals, and options reported. Achieved 100% accuracy. Ensured appropriate processes and controls are in place to accurately and effectively document all trade transactions. Ensured all futures accounts are in balance and verified that settlements, expirations, cash transfers and journal entries are completed on a daily basis with complete accuracy. 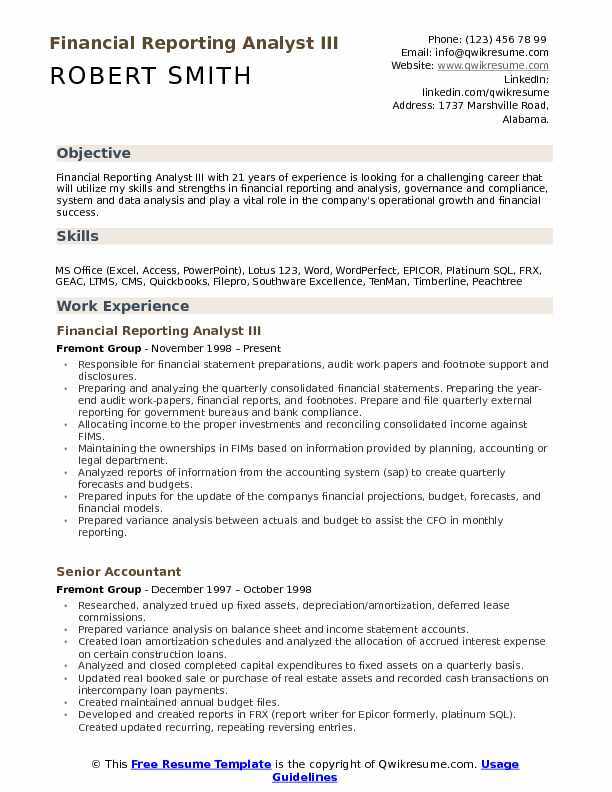 Summary : A focused detail and accuracy orientated Financial Reporting Analyst II with over 18 years of experience in financial reporting and analysis. I have hands-on experience with both internal and external reporting. I am a quick learner who utilizes available tools to create efficiencies and streamline procedures. Responsible for internal (board and executive) and external (government) monthly, quarterly, and annual reporting for the $1.1 billion in assets company. Managing the monthly consolidation process including intercompany eliminations to produce an accurate balance sheet, income statements, and statements of cash flows. Completing the journal vouchers and general ledger reconciliations for month-end close procedures. Preparing the monthly, quarterly, and year to date budget variance reports for the chief financial officer including researching discrepancies and providing explanations for large variances. Completing the external surveys to use for benchmark data and peer analysis. Producing reports to be used for completion of annual personal property taxes. Developing queries to extract data from multiple processing databases used for internal and external reporting. Producing the system generated reports as requested and modify existing reports by using the report writer function of the core data processor. Led the transition and process of each phase of XBRL reporting to be maintained in-house resulting in an approximate $50,000 annual cost savings for the company. 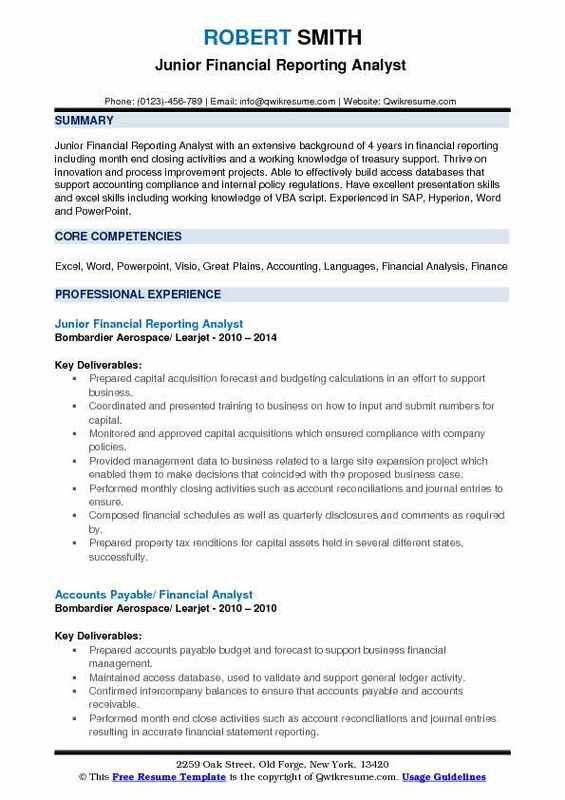 Summary : A results-driven Financial Reporting Analyst I with the ability to improve efficiencies in all facets and workflow levels of the business. Currently serving all firm Shareholders for a highly reputable, global law firm. Daily requests range from Ad Hoc reporting and analysis of work-in-progress, billing and credit reporting, for the firm. Possess superb problem-solving skills, in coordination with the strong ability to analyze current processes. Worked with the CEO, management, and consultant on design and implementation of compliance report for the attorney prebill return status. Created a template for the CEO and management team to determine the approx. Volume of billing to be completed per day, through the monthly billing cycle to determine high volume and overtime days needed to ensure monthly billing budget is met with ease. Prepared the billing and credit summaries for shareholders and clients to assist in budget management at a client and matter level. Monitored volume discounts and provide pertinent information in the like to the billing team to ensure proper discounts are being taken as billing tiers are eclipsed. Provided problem-solving support for irregularities in reporting and billing to alleviate discrepancies in the like, while maintaining a strong reputation for the law firm. Strong understanding of complex financial analysis in an effort to relay accurate client/matter revenue and profitability budgeting. Performed daily accrual and work-in-progress reporting for shareholders and clients, typically determined by the client(s) billing guidelines, prior to payment of billed fees and costs. Created ad hoc reports for shareholders to provide detailed billing vs. Payment ratios, as an integral part of the continuing business plan for current clients. 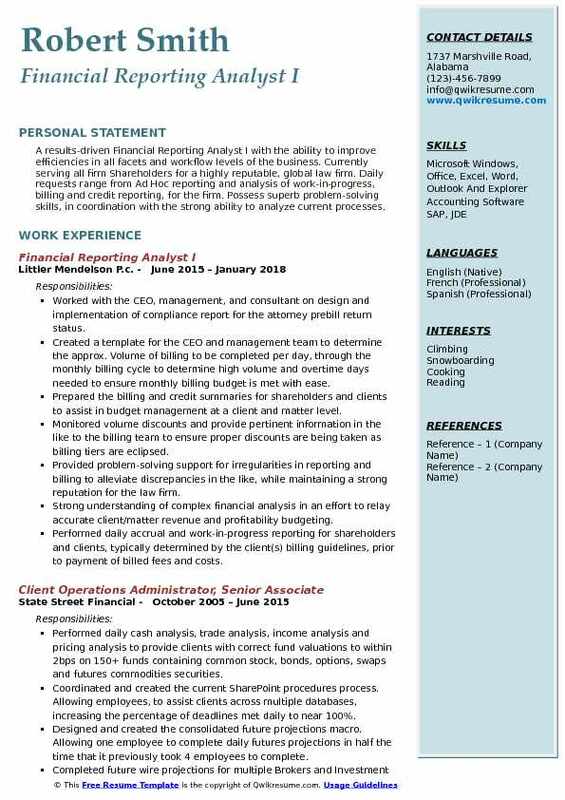 Summary : Sr. Financial Reporting Analyst for a midsized reinsurance and asset management firm with nearly four years of experience and excellent GPA from a top university. Possesses strong strategic planning, operations, modeling, analysis, and finance skills. Currently looking for a position where my analytical and communication skills can make me a strong addition to a successful team. Skills : Yardi Voyager, Advanced Financial Budgeting, Concur Travel And Expense System, Nexus Systems, CounselLink, And Peachtree Accounting System. Managing the entire month end as well as year-end processes including preparing various journal entries and account reconciliations. Analyzing the key financial statements to ensure accurate reporting in accordance with U.S GAAP. Creating the monthly, quarterly and annual revenue schedules for inclusion in quarterly and annual sec filings. Generating various audit work papers and documentation to support audited financial statements. Assisting the accounting team with reviewing quarterly sec filings. Compiling the budget schedules for all departments including monthly variance analysis and explanations as well as quarterly forecasts. Preparing the various schedules reflecting the monthly financial performance of the entire business unit to be presented to the senior leadership team each month after the close. Assisting in other reporting functions such as preparing monthly investor reports for various joint venture properties and segment report for the entire business unit which consists of over 400 properties. Calculating ratios and performing checks in order to ensure adherence to debt covenant obligations for various properties. 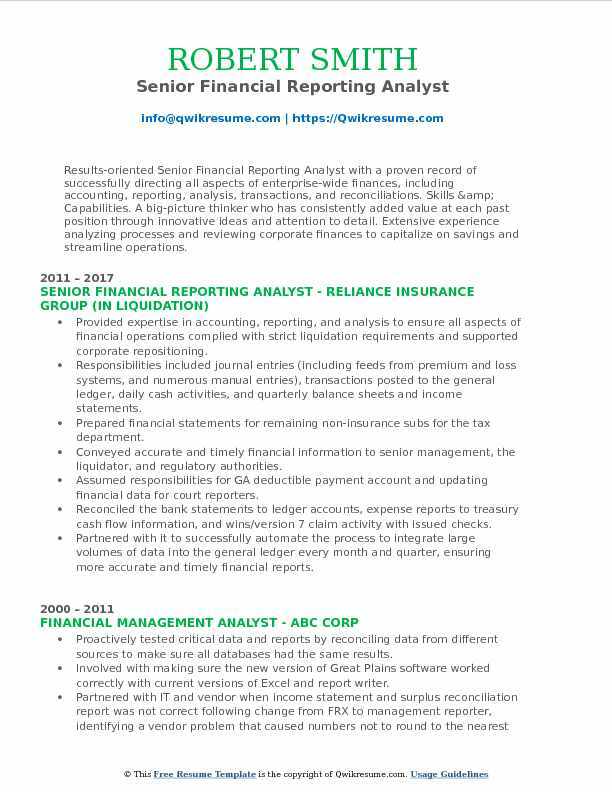 Summary : Results-oriented Senior Financial Reporting Analyst with a proven record of successfully directing all aspects of enterprise-wide finances, including accounting, reporting, analysis, transactions, and reconciliations. Skills & Capabilities. A big-picture thinker who has consistently added value at each past position through innovative ideas and attention to detail. Extensive experience analyzing processes and reviewing corporate finances to capitalize on savings and streamline operations. Provided expertise in accounting, reporting, and analysis to ensure all aspects of financial operations complied with strict liquidation requirements and supported corporate repositioning. Responsibilities included journal entries (including feeds from premium and loss systems, and numerous manual entries), transactions posted to the general ledger, daily cash activities, and quarterly balance sheets and income statements. Prepared financial statements for remaining non-insurance subs for the tax department. Conveyed accurate and timely financial information to senior management, the liquidator, and regulatory authorities. Assumed responsibilities for GA deductible payment account and updating financial data for court reporters. Reconciled the bank statements to ledger accounts, expense reports to treasury cash flow information, and wins/version 7 claim activity with issued checks. Partnered with it to successfully automate the process to integrate large volumes of data into the general ledger every month and quarter, ensuring more accurate and timely financial reports. Formalized income and expense schedules with explanations on each line item and numbers updated weekly, ensuring accuracy by actively investigating all anomalous entries. 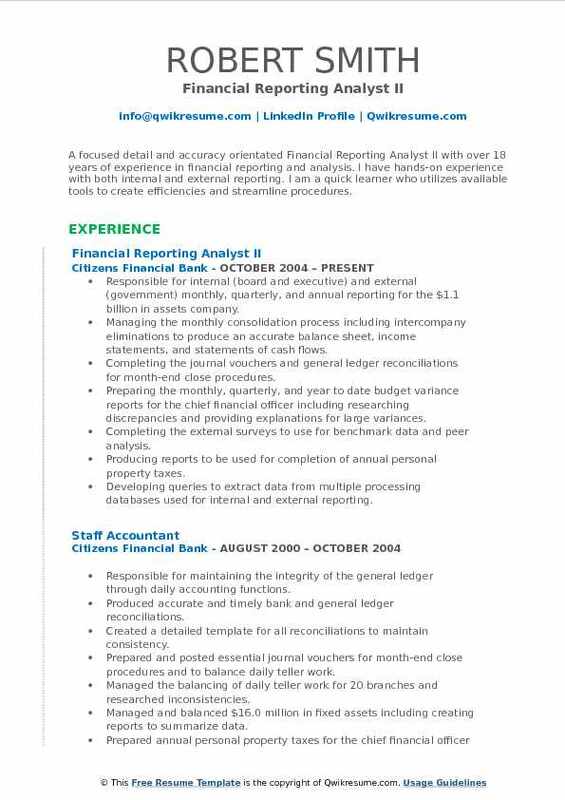 Summary : Financial reporting analyst with over 14 years of corporate accounting experience. Financial analyst within property and casualty with expertise in fiscal and financial reporting. Accomplished and the results oriented professional who consistently meets deadlines. Analyzes and interprets accounting records. Preparing and releasing the monthly operating financial statements to the senior management team, which includes month-end, quarter close and year-end closes, Management report including revenue and expense variance analysis. Preparing the research agent 1099s, monthly agent shortage reports, agent folio deductions. Created efficiencies within the state monthly financial reports, savings of 24 hours per month. Created efficiencies within the accident year monthly financial reports a savings of one hour per month. Lead the reorganization of the monthly financial operating statements for all books of business. Collaborated with colleagues to reduce monthly $3 million out of balances between cash bank reconciliation and farmers suspense reconciliation (farmers temporary 30-day holding account). Creating and maintaining account structure, performing journal entries and cash flow reconciliations. Developing dynamic reports to provide visibility for comparative ad hoc analysis or projects. 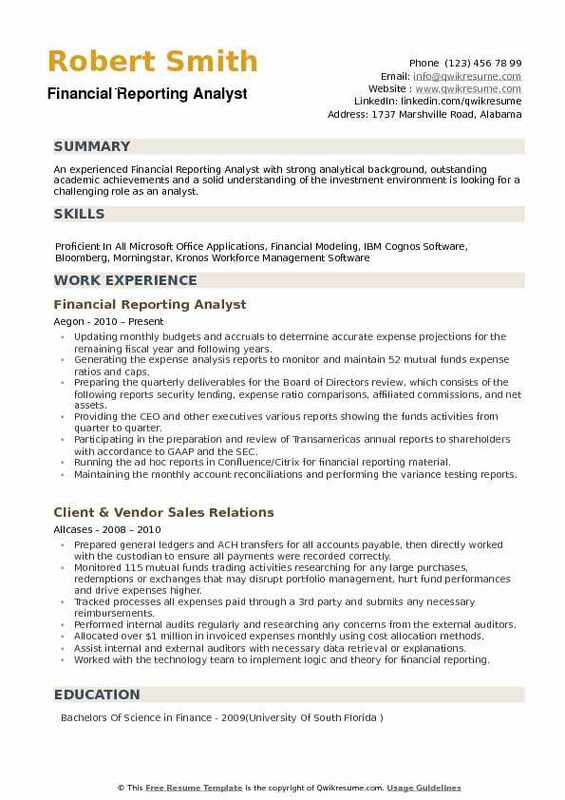 Headline : Financial Reporting Analyst experienced in financial reporting utilizing numerous databases to create reports. Expert in Microsoft Office and SSRS reporting based reports. Member of the Direct Selling Association Industry Research Committee. Responsible, of the preparation and timely submission of all internal and external reporting. Working closely with the Controller and the Accounting team in the monthly closing process, while performing quality control tests to assure the accuracy of reported numbers. Working closely with the corporate tax department in the preparation and submission of all local tax. Responsible for working with the external Auditors during the annual financial audit. Assisting in the preparation of the annual Financial Statements (FS) of all three reliable affiliated. Analyzing and explaining the monthly variances to be presented to both local management and the parent. Responsible for executing quarterly audits to the accounting team with the purpose of ensuring compliance with regulations and procedures established both internally and by the parent company, and discussing findings with management. Working as a linkage between the parent company and all internal service and operational departments in all subjects related to accounting and reporting requirements. Responsible for assisting directly the Corporate SOX team in performing walkthroughs and control. Summary : An experienced Financial Reporting Analyst with strong analytical background, outstanding academic achievements and a solid understanding of the investment environment is looking for a challenging role as an analyst. Updating monthly budgets and accruals to determine accurate expense projections for the remaining fiscal year and following years. Generating the expense analysis reports to monitor and maintain 52 mutual funds expense ratios and caps. Preparing the quarterly deliverables for the Board of Directors' review, which consists of the following reports: security lending, expense ratio comparisons, affiliated commissions, and net assets. Providing the CEO and other executives various reports showing the funds activities from quarter to quarter. Participating in the preparation and review of Transamerica's annual reports to shareholders with accordance to GAAP and the SEC. Running the ad hoc reports in Confluence/Citrix for financial reporting material. Maintaining the monthly account reconciliations and performing the variance testing reports.